Many folks have asked about the reality of running a farm. As the owner of a winery on the Marin/Sonoma border from 1986-1993, I can tell you that there is little romance in agriculture - it's hard work. In my ongoing Thursday personal posts about Building Unity Farm, I'll tackle a variety of lessons learned as I've transitioned from suburban gardener to rural farmer. First the basics. Alpacas and llamas are native to the Andes of southern Peru, northern Bolivia, Ecuador, and northern Chile. They enjoy cold, dry weather and do not do well in New England Summer heat. A barn or loafing shed with cooling fans, fresh water, and access to hay is essential. We improved our barn to create male and female indoor living areas (Camelids ovulate on demand, so you do not want them living together unless you want an every increasing herd). We cut (with Japanese hand saws) thick rubber floors to provide a clean, durable surface in the barn. We installed heated buckets (to keep water from freezing in the winter) hung on wall brackets 32 inches off the floor. We hung indoor hay saving feeders. 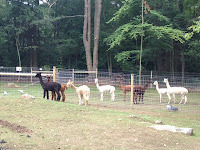 We added mineral feeders since alpacas and llamas need access to selenium salts to stay healthy. We mounted circulating barn fans to keep the living areas cool. Finally, as part of our overall fly management program we hung flytapes. We clean the indoor areas every morning at dawn using rakes and manure scoops. I built a 16x16 foot manure management area (picture shows the compost, manure and woodlot management areas) to compost the 5 tons of "llama beans" we'll move every year. Outdoors, we fenced (5 foot woven wire with electric top wire) 1/2 acre for each gender and created gates that enable us easy access to the paddocks for feeding, cleaning, and herd health (monthly medications, toenail trimming and weighing). We added covered 6 foot feeders and hanging water buckets. We planted a mixture of orchard grass, timothy hay and alfalfa in our paddocks and in an adjacent pasture where the alpacas (one gender at a time) can graze during the day. We have coyotes roaming our property and the adjacent 50 acre apple orchard, so we needed to plan for livestock guardians. 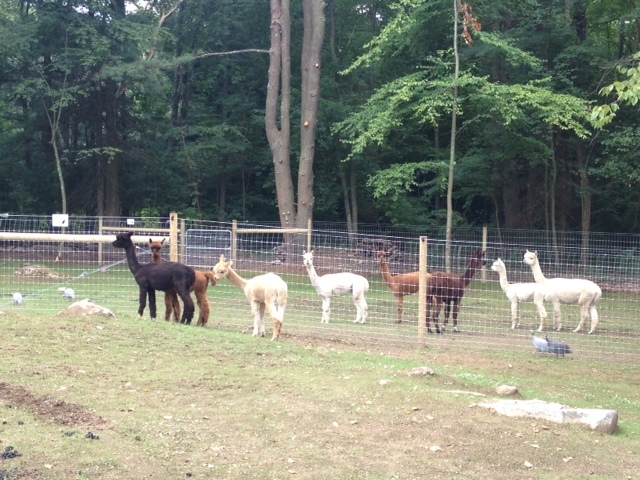 We placed two Great Pyrenees Mountain dogs in the male paddock and a large llama in the female side. Camelids eat 2% of their body weight per day, which means that we need about 10,000 pounds of hay per year. We built a hay loft capable of storing 7 tons, adding seven foot loft doors for easy loading from delivery trucks and ventilation to keep the hay cool and dry. We did all over this before the camelids arrived. Our daily routine includes cleaning the inside and outside living areas, refreshing water/food/minerals, and spending time with each animal to ensure they are healthy. There's nothing like hot llama breath or a nose to nose alpaca nuzzle to start your day. At night we repeat our morning chores, feed the guardian dogs, and turn on the electric fence. When we're woken by alert barking (or llama yodeling) in the middle of the night, we chase away predators. Although we do not own a firearm, we have taken classes in firearm safety should we ever need to provide another layer of defense. On weekends, you'll find me sitting in the paddocks with my laptop, a dog at my side, and alpacas eating fresh second cut hay (the September harvest is higher in protein and sweeter than the July first cut hay) and guinea fowl running around the barnyard eating insects. It's hard work, but the sights and sounds of a camelid filled barnyard are priceless. Having grown up on a sheep farm that has now gone back to nature, you will be amazed by the entire ecology that develops around the livestock. The animals and their grain foods naturally support an increased population of insects and rodents, which provides food for not only cats and small birds, but also owls, hawks, and bats. Embrace nature's attempt to create/maintain a balance; provide shelter for the birds, especially the owls, and the bats -- your outbuildings are a great start. Once I retired from shepharding, the ecology quickly reverted -- some for better (fewer rodents and bugs), some not (fewer owls and bats). Enjoy! Great updates on your transition to rural farming. 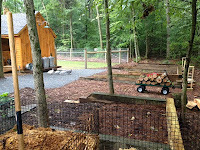 Thanks to a great volunteer opportunity at an organization in Northern Virginia, Arcadia Center for Sustainable Food and Agriculture (http://arcadiafood.org), I have been increasingly involved with the efforts to support sustainable farming and agriculture. I will look for your Thursday posts. Good luck with the fall planting and herd management! 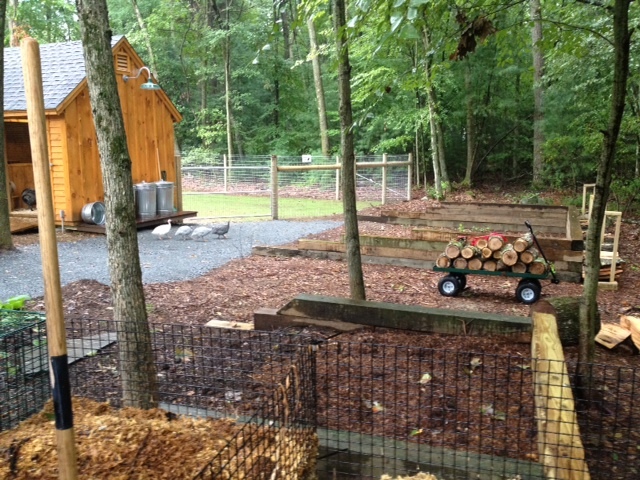 esWe have heard about the animals on your farm - amazing for my CIO - but what about your Square Foot Garden this year? I tried this method for the first time and my wife and I are amazed at the results.